The story behind Fishbone Soundclash, Basque Rockers and Mestizo Music Mania! Every year, Fuji Rock hosts at least one of those crazy Latin bands that play high-energy music makes you dance so hard your legs ache for the rest of the weekend. Their presence is almost always due to the work of Shogo Komiyama, head of the Japonicus, a music promoter who for nearly two decades has been bringing “mestizo” artists –– musicians mixing Latin, Caribbean and international influences –– from the Iberian peninsula, southern Europe and the Americas to Japan. This year, Shogo’s arranging much of the Friday night line-up at the Crystal Palace Tent, will host the Basque Country rockers Esne Beltza on the White Stage, and has set up a bunch of great vinyl DJs for the Blue Galaxy Tent on Saturday night. 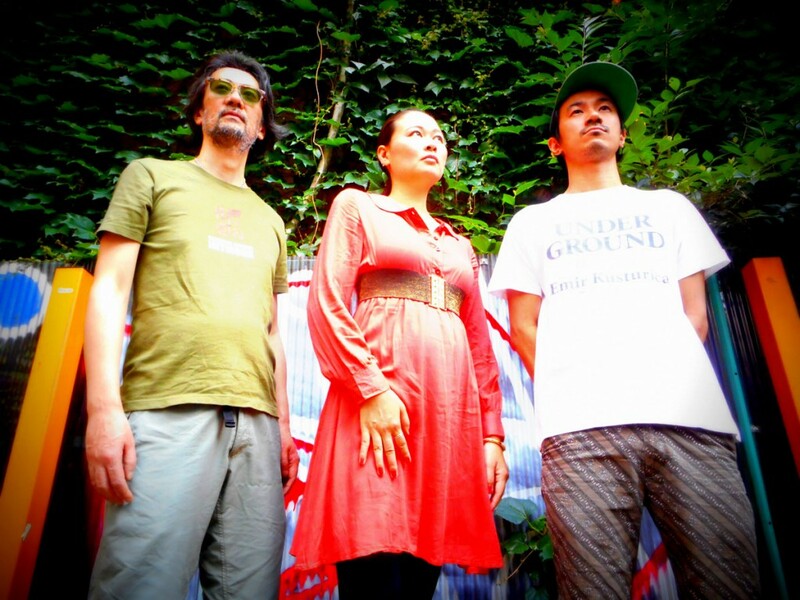 To get the inside scoop on all the mestizo music action on and around Fuji Rock weekend, we caught up with Shogo for a quick preview of the Latin, ska and other music coming to Fuji Rock this year. Q: How long has Japonicus been working with Fuji Rock? I know we’ve talked about this before, so briefly, how did the connection start? This year is going to be our 20th Fuji Rock festival. I have a friend that introduced me to [Fuji Rock founder] Masahiro Hidaka and that was the beginning of this long relationship. Q: OK, got it! Now please tell us about THE FISHBONE SOUND CLASH!!! 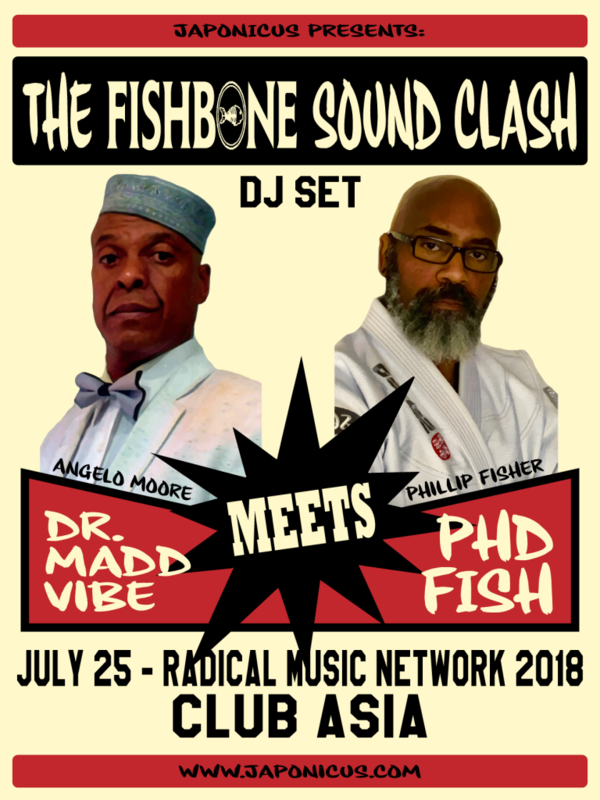 DR MADD VIBE MEETS PhD FISH, which is happening at both Radical Music Network (7/25 @ Tokyo) and at Fuji Rock (7/27 @ Crystal Palace). What the heck is this? And how did it come about? We meet Fishbone frontman Angelo Moore this year in Taiwan during the Urban Nomad Opening Freakout Festival in April, and we also went on to organize Angelo’s Tokyo shows as part of that tour. While Angelo was here in Japan in April, he did a gig in one of our monthly events called Clandestino. This event is held at Café Lavanderia, which is an anti-fascist, bar and the party is based on rebel music. He was very interested in the concept of our event, so I mentioned to him that we are doing probably the first and oldest rebel music festival in Asia. It’s called the Radical Music Network. After a brief explanation about the event’s concept and what we’re fighting for, he said to me… “I want to be a part of it! !” This is how it came about, and from that moment we started to talk with Fishbone`s management and the Fuji Rock Festival. All parties were very kind, and this idea came to reality in a very short time!! The Fishbone Sound Clash!!! Dr Madd Vibe meets PhD Fish! It’s a DJ set by two key members of Fishbone and will be supported by Caribbean Dandy & DJ Txako at both events! I can’t wait to see them together!! Q: Esne Betlze is traveling to Fuji Rock from the Basque Countries. Please tell us about this band. Do they have any special relation to other Basque musicians you’ve worked with in the past? Esne Beltza is one of the most popular mestizo bands in the Basque Country and in Europe. 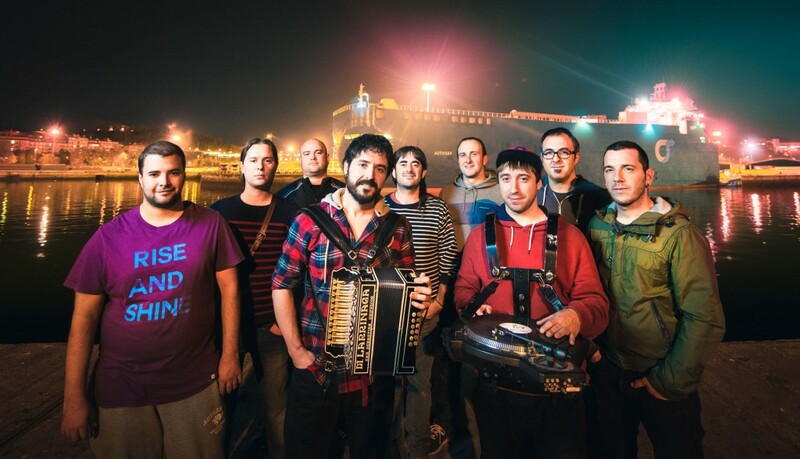 The group is led by Xabi Solano, who plays Basque accordion, and DZ, a DJ. Both of them used to be members of Fermin Muguruza’s band. They started making their own songs during Fermin Muguruza’s world tours, and Fermin gave them the name Esne Beltza, which means “black milk” in the Basque language. It’s black music made by white people. Q: Brahman played at your first Radical Music Network party in 2000, and this year they’re the Saturday night headliner on the White Stage. Please tell us about your relationship with this band and why Brahman is so unique and important in Japanese indie music? I think Brahman is one of the few real independent bands from Japan. They sell more records than many major (mainstream) bands, but they are still doing everything on their own as an independent band. I think that brahman is more than an indie band… I think they are a kind of social phenomenon. Q: What should we look out for at Radical Music Party, which is perhaps Fuji Rock’s best pre-fest party in Tokyo? This year’s lineup includes many top artists and some of them are going to be performing Fuji Rock as well. Just to mention some of them…the Fishbone Sound Clash!!! Dr Madd Vibe meets PhD Fish, Esne Beltza, Caribbean Dandy, Theater Brooks leader Sato Taiji, legendary reggae star Rankin Taxi, a solo project from Cubismo Grafico’s leader called Learners, the Dolomites (ex Gogol Bordello), Astro Black (US), Lui Bluesface (ex Tokyo Ska Paradise Orchestra), Peoplejam and Japan’s best mestizo artists Tex & Sun Flower Seed, EKD, Marleys, Los Cabrones and many more!! Q: OK thanks Shogo! Good luck with the preparations! We can’t wait! ASTRO BLACK – Australia-based party-rocking’ reggae DJ, originally from Los Angeles. Playing at the Crystal Palace (7/27) and Blue Galaxy Tent (7/28). ESNE BELTZA – Rockers from the Basque Country in northern Spain, performing at the Crystal Palace (7/27) and on the White Stage (7/28). 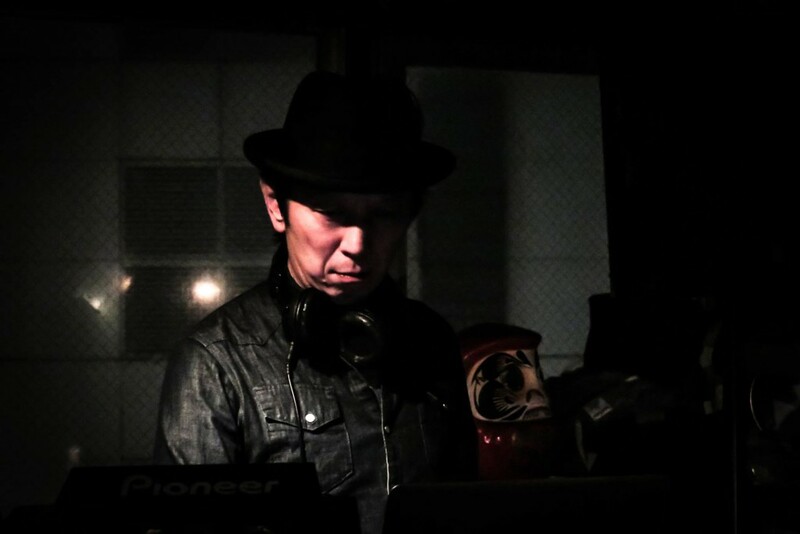 KAZ SUDO – Japanese mestizo music DJ. 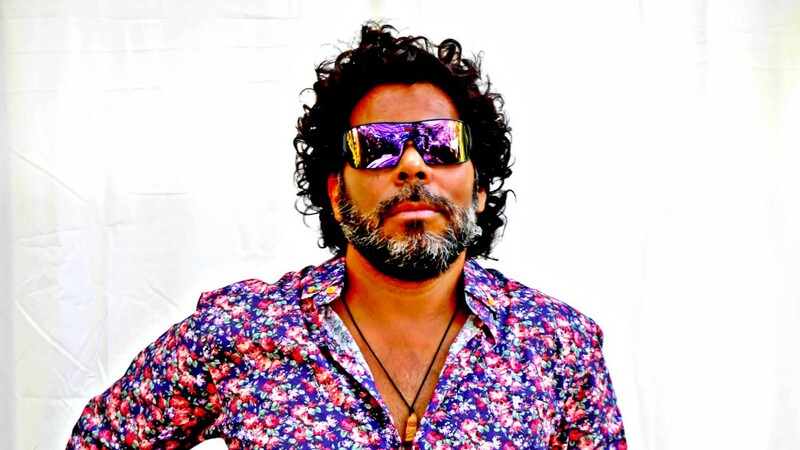 CARIBBEAN DANDY – Latin and ska DJ specialists, Crystal Palace mainstays, and Fuji Rock regulars, with more than 10 appearances at the festival. 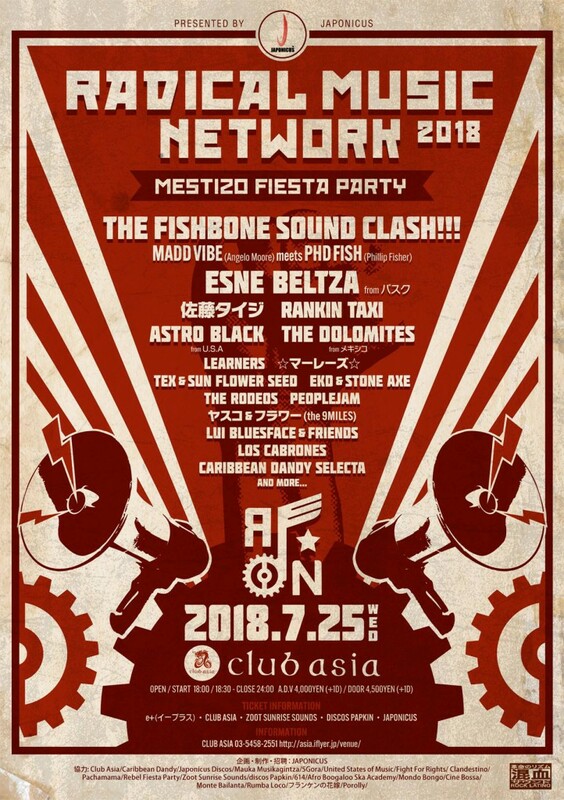 RADICAL MUSIC NETWORK 2018 – A Fuji Rock pre-party on Wednesday 7/25 with around 20 performers, playing Latin, ska, mestizo, and more! Discount entry for international passports.